Crypticon's Godzilla Power Hour panelists (from left to right) K.L. Young, Kyle Yount, Aron Tarbuck, Jeff Burk & Nick the Hat wowed the crowd on a rainy Father's Day. The download you’ve all been waiting for, folks! Episode number EIGHTEEN is up and running and ready to tantalize your earbuds! For this episode of the Kaijucast, I travelled North to the Emerald City – otherwise known as Seattle for the 2010 Crypticon Horror Convention. I drove up specifically to be on a panel with other Godzilla fans to talk about the history of our giant radioactive deity. The coolest part about it was meeting new fans, Kelly Young, Aron Tarbuck, Jeff Burk and Nick the Hat. While doing this, I recorded the panel and that audio takes up a majority of this month’s show. I will warn you that the audio quality is a little rough since we didn’t have any fancy sound equipment, but it is definitely enjoyable. Additionally, you’ll find links to some of those fine fans’ websites below in the Suggested Reading portion of the post. This month’s Daikaiju Discussion was about the first Gamera movie and I got some great comments from everyone. So please continue to keep up the good work, class! 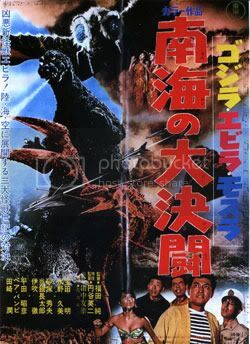 The seventh homework assignment for our monthly Daikaiju Discussions will be to watch the classic 1966 Godzilla flick, Godzilla vs. The Sea Monster – specifically the Sony DVD. I’m not sure if we’re going to watch the Engliush dub or the subtitles, but feel free to watch either. If you want to partake in the discussion, make sure you send me your comments, questions and reviews before the last week of the month. Email anything you’ve got to controller@kaijucast.com and I’ll make sure to include your responses in the next episode. Download the eighteenth episode of the Kaijucast right here! Feel free to write me if you have any music requests, are enjoying the podcasts or if you, questions or even ideas for future shows, too – also don’t forget to follow the Kaijucast on Twitter or become a fan on Facebook. We are on both iTunes and the MS Zune Network as well, so if you listen through an iPod or Zune, you should be able to subscribe to the show and have the episodes download automatically to your player.